This new text provides students in the run-up to exams with a comprehensive review of possible causes for symptoms and conditions as well as the key facts of around 100 diseases, following the Rapid mnemonic. There will also be an appendix giving details of immunisations as well as a list of Further Reading and useful web sites. Clinical students working on Emergency Medicine and General Practice attachments will find this book extremely useful. It may also interest those planning electives abroad. Junior doctors and GPs will find this a handy resource for quick access to information on the symptoms and diseases they may encounter in the clinical setting. 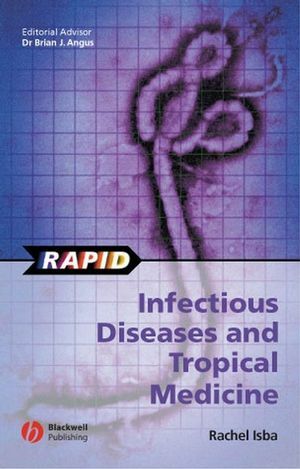 Rachel Isba is the author of Rapid Infectious Diseases and Tropical Medicine, published by Wiley. Part 1: Signs & Symptoms. Upper Respiratory Tract / ENT. Skin and soft tissue infection. Haemolytic uraemic syndrome (E. coli O157). Appendix I: Immunisations and Malaria prophylaxis. Appendix II: Antibiotics (therapy and prophylaxis) and needlestick prophylaxis. "This book is a brief and quick source for key features to common infectious diseases. It can be used for a brief overview, nothing more. It is easy to read and has somewhat helpful tables to assist with categorizing pathogens."